From January 2018 please be aware that we will open on Thursdays, Fridays and Saturdays. Booking in advance is strongly recommended. We will however be open on valentines night which this year falls on a Wednesday, places are limited so early booking is advised! 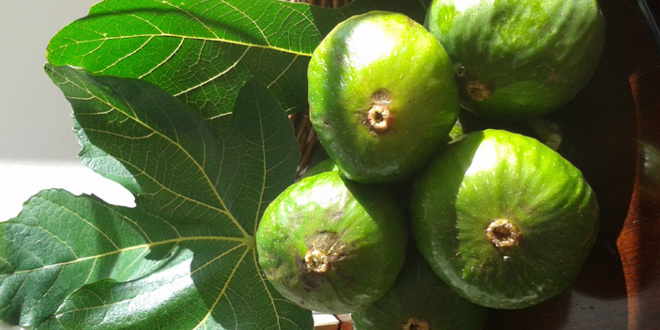 Welcome to the Quo Vadis website. 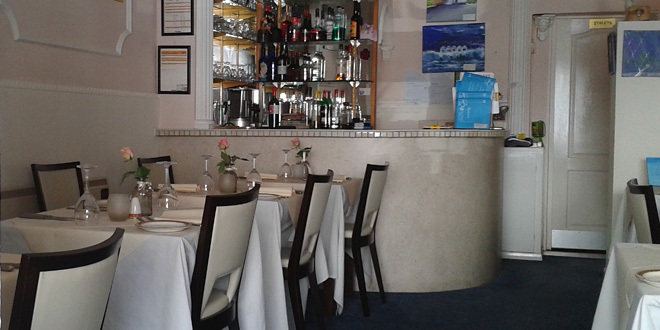 Our Italian restaurant is located in the heart of Torbay, in the delightful seaside town of Paignton in Devon. 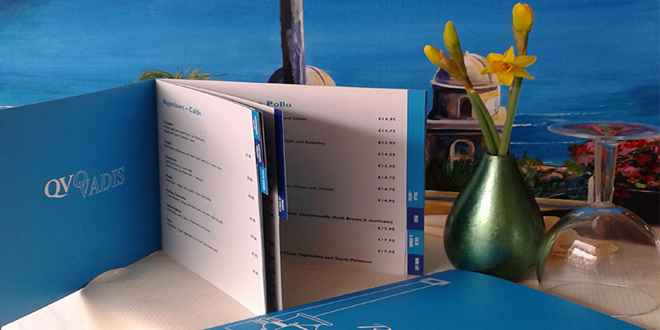 Our menu has been created using dishes that carry a classic memory, mainly from the sixties and seventies. 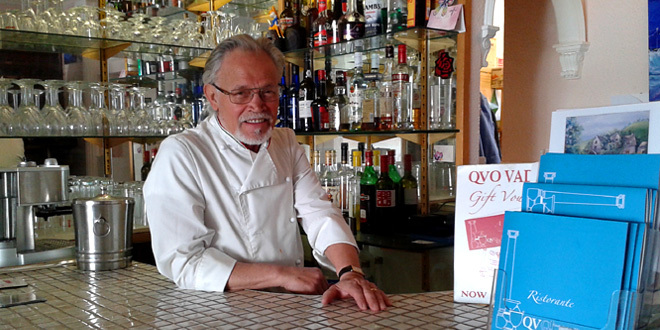 Michele at that time was working here in Torbay and using his flambéing skills in ‘a la carte’ restaurants. Before making the decision to buy our own restaurant Michele had spent six years working at ‘Vergines’ a very avant-garde nightclub and high class restaurant with a good reputation for fine dining. The choices on our menu are tried and tested classics, so please take a look and see for yourself the favourites. For our younger diners its a great way to try food a little unfamiliar . We also pride ourselves on being able to adapt on the night for individual palates – leaving out or adding more ‘garlic’ or ‘chilli’ for example! 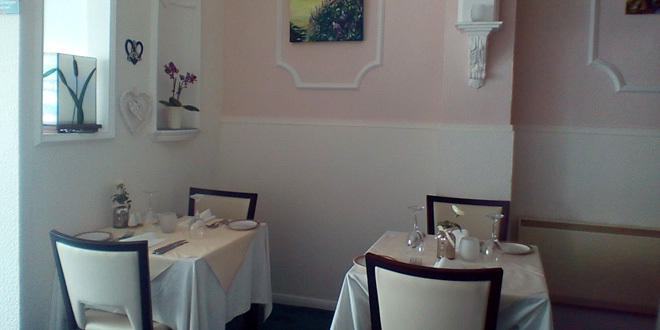 We are fully allergy aware and will happily advise or discuss individual requirements. Well here we are Sept 2016……30 years. 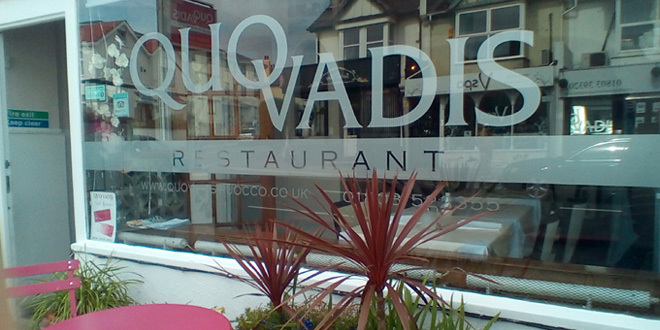 It’s now 30 years since we opened Quo Vadis! 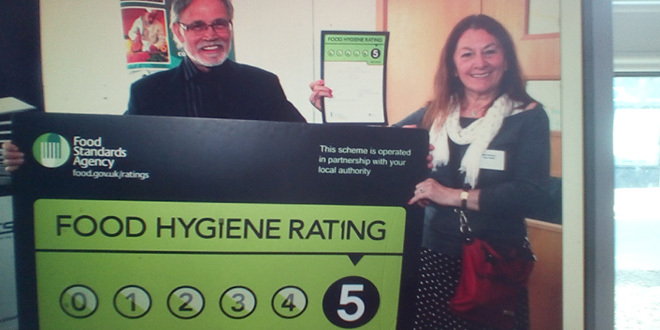 Quite an achievement for a small independent restaurant. Having survived 2 recessions and a few personal crisis’s but still going strong! If we regard 30 years as a success it is due not only to our own dedication and tenacity but to those people who’ve helped us along the way – friends who’ve been supportive by patronising Quo Vadis and colleagues who’ve laboured in the kitchen and front of house often under tense and overheated situations ( not quite Gordon Ramsey but a close second!!!) my own family, children and relatives included who’ve coped well with the difficulties and unsociable hours of the catering trade a business that at times has taken over their live ..I have really appreciated your understanding. Michele and I now feel it’s time to at least wind down, by working slightly less hours and taking a more laid back attitude…an occasional weekend away as we head towards retirement? We are not considering hanging up our ‘whites’ immediately of course…but a year possibly? With respect for my customers I will always endeavour to keep them informed. One of the nicest things about running Quo Vadis is the people we have met along the way…those holiday or occasional clients and those who are now firm friends I thank you all. For nights spent over sambucas and cigarettes in debate, to the youngsters with ambition and new ideas within catering. ( One of the pleasures of catering has been to introduce lost classics to the younger palate) especially as Michele is so skilled with those dishes. Quo vadis has brought us a long way from a young Neapolitan and a Paignton girl…both with very different interests but working and facing problems together we have succeeded in keeping our business solvent and thriving. Unless stated, all photos, videos & content ©Copyright Quo Vadis ©2015 - 2019 . All rights reserved.